After beginning his practice in 1996, Paul joined Phillips Parker Orberson & Arnett in 1999. He practices primarily in the area of civil litigation. His work concentrates on a variety of civil litigation areas, including construction defect, work site injuries, commercial motor vehicle accidents, personal motor vehicle accidents, personal injuries, insurance coverage, workers’ compensation and commercial/business litigation. Paul is licensed to practice in State courts in both Indiana and Kentucky and admitted to practice in Federal courts for the Eastern District of Kentucky, Western District of Kentucky, Southern District of Indiana and the Sixth Circuit Court of Appeals. 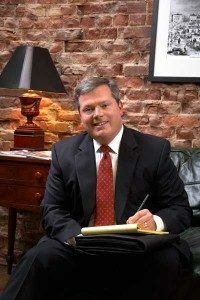 He is a member of the Kentucky, Indiana and Louisville Bar Associations. Paul is a member of the Defense Research Institute, Kentucky Justice Association and the Kentucky Defense Counsel. Paul has successfully defended a variety of jury verdict cases involving commercial motor vehicles, work site injuries, construction defects, premises liability and personal injuries. Other successful defenses have come through summary judgments, hearings and mediations. Paul is married with three children (all boys). He is a proud supporter of the American Cancer Society.